As the new President of SEDRA, I have a desire to make a positive difference just like those before me. Our annual meeting and awards banquet was well attended and as always, full of fun and lively conversation. All the proposed rule changes were voted in, new BOD members have accepted their positions and all our award winners were full of joy on how well they and their equine partners did this past season. We also have 3 new lifetime members. One of my goals for this season is to increase awareness about SEDRA to others. 14 years ago, I had a member come up to me touting the value of SEDRA and that I NEEDED to join. We need to bring back that enthusiasm! I’ll be handing out membership forms at rides I attend and I encourage others to do the same. Remind riders that ALL breeds of horses and mules are welcomed just like AERC. All our forms are on our website at DistanceRiding,org under the Online Forms tab. Membership opportunities are available for individuals, families, juniors and those that no longer compete but are still involved with our sport. If you recently joined, WELCOME! Did you nominate your horse for awards also? There is a separate form for your equine partner. I encourage you to review all the forms so as to not miss an award opportunity. Many of you have already reached out to me on various club items with the most prominent issue being the website. I hear you! An ad-hoc committee is reviewing our options and will present their findings at our upcoming board meeting. Our Facebook page has been flourishing with activity. 2 additions have been made to include a chat group and sale page. Please check us out if you haven’t already. Summer months are a great time to try other venues with your horse while our competition calendar is empty. 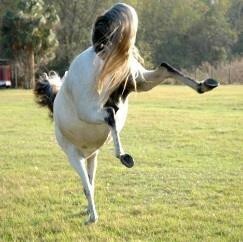 Obstacle courses, poker rides and dressage lessons help round out your horse. 2 of our members have posted their upcoming events on our FB page. Our next Board of Director’s meeting will be held on July 27 at Noon. Lunch will not be provided. Please RSVP to me if you will be attending. Until we see each other again…Happy Trails! 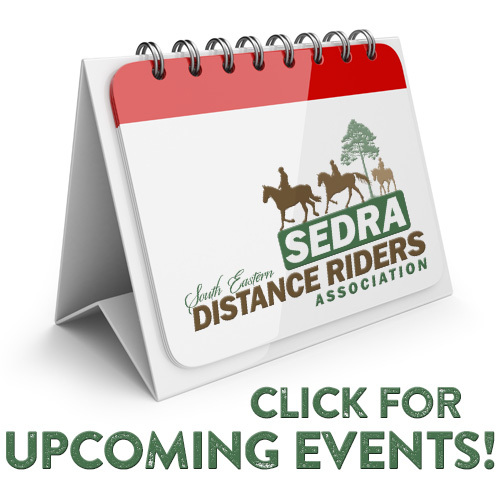 The SEDRA 'Webmaster' is, more or less, the voice of the South Eastern Distance Riding Association Board of Directors. We would like to thank all of the members and supporters who have contributed over the years to one or more of our special programs, volunteering, educational clinics and/or our trail preservation fund! THANK YOU for your much appreciated contributions and continuing support of the long distance riding sport!